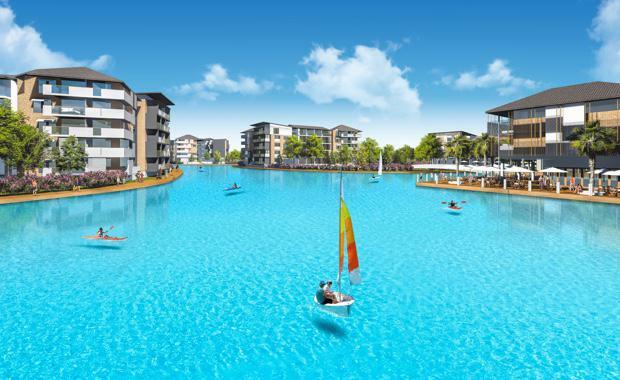 Tropical North Queensland will be home to the first Crystal Lagoon in Australia, following the announcement today of an agreement to create a 2.2 hectare lagoon as the centrepiece of a new 1,000 home residential development in Cairns. The lagoon will extend 700 metres through the centre of the Botanica development and allow the majority of apartments, townhouses and villas in the $200 million master-planned community to enjoy a waterfront location where residents can swim and sail in safe environment inside the man-made crystalline lagoon. The precinct will also feature a beach club, restaurants, cafes, walking trails, tennis courts, sporting fields, commercial space and 8km of landscaped gardens. Tree planting has already begun on the 32 hectare site. Crystal Lagoons Oceania Director German Rocca said the signing of the agreement marked an important milestone for the US-based technology company and the developer, Botanica Property Group. “The lagoon at Botanica signals a turning point in Australian real estate development,” said Mr Rocca. “Crystal Lagoons offers the world’s top amenity and the future residents of Botanica will be the first in Australia to enjoy the lifestyle benefits of an idyllic beach and the pristine water of a man-made lagoon in their backyard. Botanica last year gained Preliminary Approval from Cairns Regional Council for the master-planned development in the Cairns suburb of Caravonica and today’s agreement means it can now progress to the next stage of planning. Botanica Property Group Director Rob Wallace, who travelled to Mexico several years ago to inspect one of the first Crystal Lagoons projects, said the vision for Botanica had been shaped around the provision of a swimming lagoon. “We want to make Botanica a lifestyle destination where residents can enjoy this incredible 2.2 hectare lagoon, ” said Mr Wallace. “I travelled to Mexico to see for myself whether Crystal Lagoons lived up to the promise and that experience confirmed the huge potential for a lagoon in our Botanica development. “We have a warm tropical climate and a lagoon is going to put this development on the map and deliver a huge boost to the region. Crystal Lagoons consume around half of the water required by a park of the same size and up to 30 times less than a golf course. They can use any kind of water – salt, fresh or brackish, or water from underground aquifers in deserts. Water quality is maintained through patented technology, monitored around the clock from Crystal Lagoons headquarters in Miami, and compliant with the highest international sanitary standards. Mr Rocca said the quality of water in Crystal Lagoons had been certified by independent studies that confirmed the quality of water exceeded that of sea water, lakes and pool water.